Backup System Scheduled daily, weekly and montly. We provide web hosting services on our servers from Europe (Romania) located in professional datacenters and uptime guaranteed of 99.9%/year, kept at this level for years now. We have over 7 years experience of providing professional web hosting services. 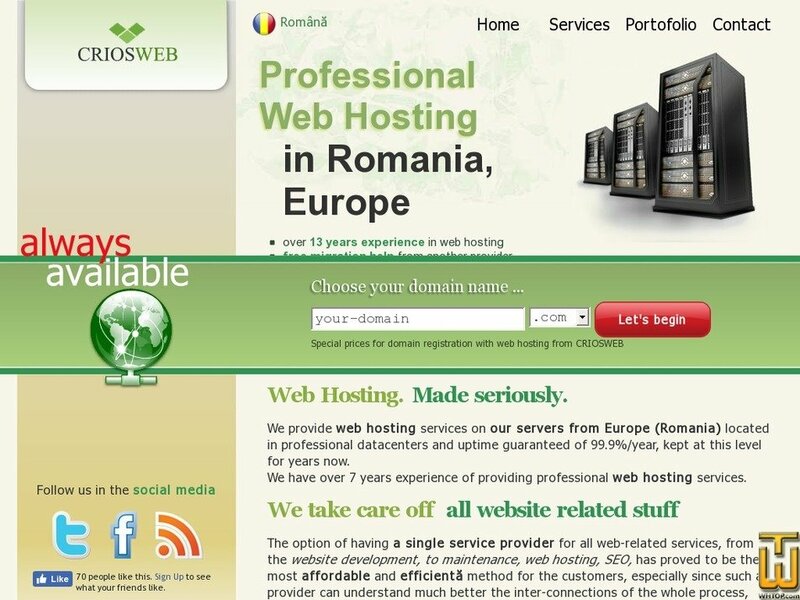 The web hosting servers are located in a Tier 3 datacenter from Bucharest, Romania. The datancenter has high-speed, redundant connections to the internet. The continuous supply of electricity is provided by mulitiple power feeds, large capacity uninterruptible power supplies and diesel generators which automatically come into operation in case of longer power failure. In these datacenters special security, cooling and ventilation conditions exist. We regullary make local backup copies. Periodically, all data is safely copied in an additional datacenter to be able to recover from accidents/disasters. The servers are proactively monitored 24/7. Price: € 14.49/mo. VAT 20% exc.